Notes: Gatewen Halt was situated on the Great Western Railway (GWR) Moss Valley branch which ran from a junction with the Wrexham & Minera Railway at Moss Junction to Moss and onwards to Brynmally Colliery. The line opened as a single-track railway on 11 May 1882. At two miles in length it had been constructed so that locomotive-hauled trains could reach collieries and other industrial premises at the north end of the Moss Valley. A railway from Wheatsheaf Junction, on the Chester and Shrewsbury line, to Minera had opened in 1847 and it passed through Moss and so was able to serve the industries there. The 1847 line was a great success, but it was very steeply graded and had two rope-worked inclines which, as the nineteenth century progressed, impeded the smooth flow of traffic. The Moss Valley branch improved the situation greatly. The line was built as a goods railway but on 1 May 1905 the GWR introduced a ‘railmotor’ service between Wrexham General and Moss. Halts were opened at Gatewen, Pentre Broughton, Gwersyllt Hill and at Moss. Gatewen Halt was located on the south side of Gatewen Road. It had a single wooden platform on which stood a corrugated iron waiting shelter. A sloping footpath connected the platform to the road. The halt was unstaffed. 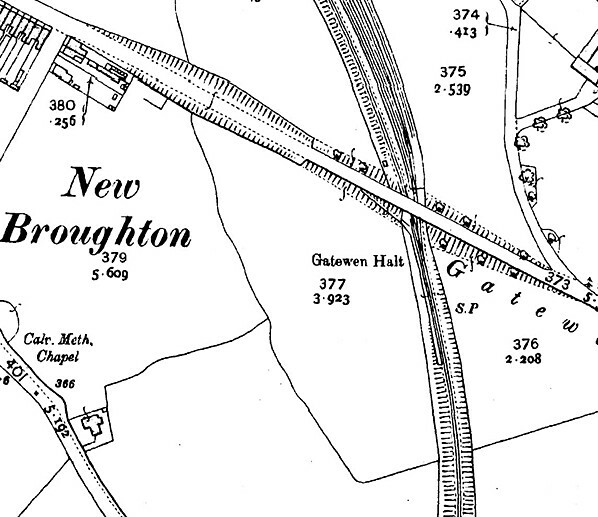 To the north of the halt was Gatewen Colliery which was connected by rail to the Moss Valley branch. The July 1922 Bradshaw showed ten weekday departures from Gatewen Halt for Moss Halt and ten for Wrexham General. On Saturdays there were thirteen services to Moss and to Wrexham. There was no Sunday service. Bus competition had started to make inroads into passenger traffic receipts by the early 1920s. By the early 1930s passenger services on the Wrexham and Moss line were hopelessly uneconomic, and the GWR withdrew the service completely with effect from 1 January 1931; Gatewen Halt closed completely on this date. 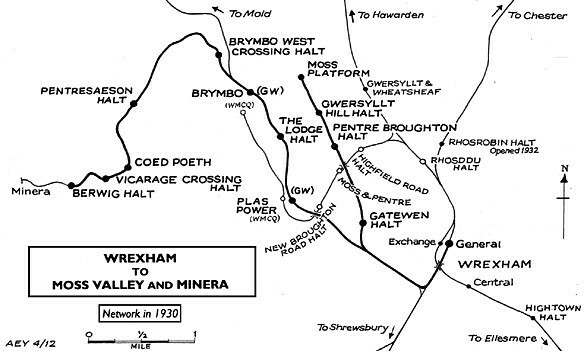 By the 1930s the mines of the Moss Valley were worked out and, as a result, the Moss Valley line closed in 1935 when Brynmally Colliery closed. The track remained in situ until 1952. In 1957 the site of Gatewen Colliery was developed as a coal dispatch point for opencast working at Vron. The 'Gatewen Opencast Disposal Point' as it became known was provided with a rail connection via the eastern end of former WM&CQR Brymbo Branch. 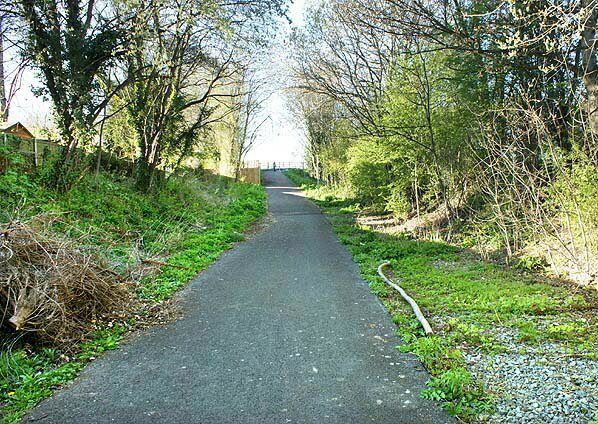 The trackbed of the Moss Valley line was re-used for sidings from the site of Gatewen Halt to a point just to the south of Pentre Broughton Halt. In the early part of 1966 the operation ceased. 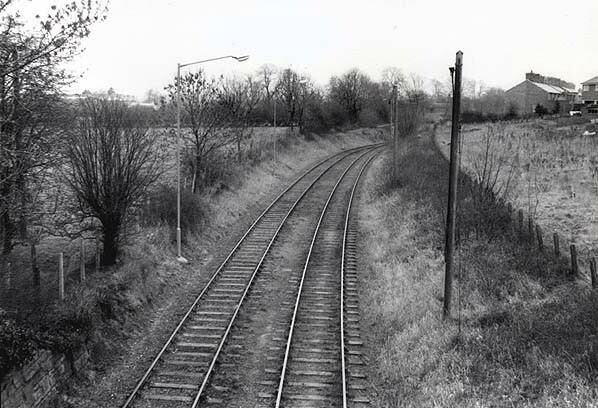 In 1972 the Disposal Point was once again in use but by this time the line south from Gatewen Halt to Moss Junction had been re-laid and re-opened and trains serving the facility travelled along it. The remaining section of the WM&CQR having closed. 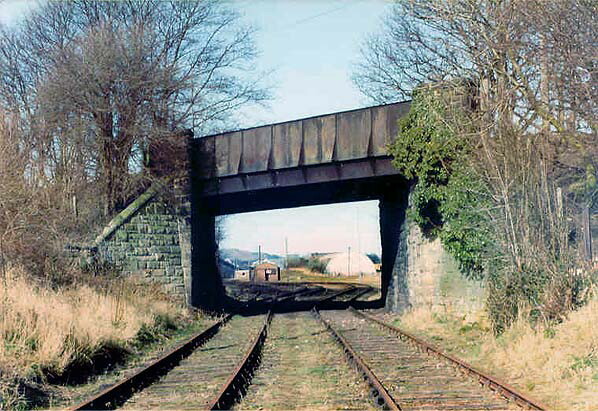 Trains passed through the site of Gatewen Halt until August 1983 when a derailment at Gatewen damaged the track. The reopened section of the branch lay out of use until 1989 when it was lifted. 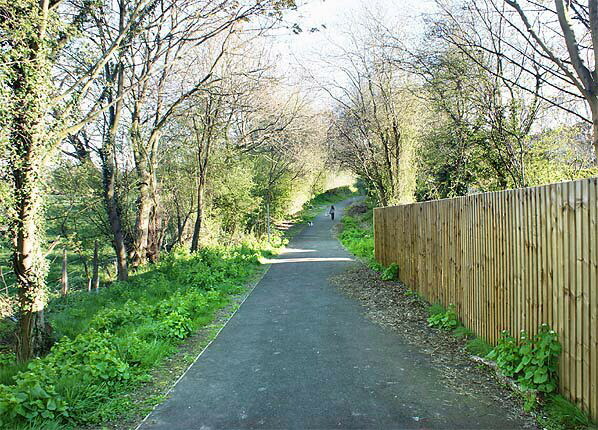 In 2011 the Gatewen Colliery site was developed with housing, and the railway was converted into a footpath. Forgotten Railways - North and Mid Wales, Rex Christiansen, 1976, David & Charles. Looking south at the site of Gatewen Halt in February 1980. The platform had been located on the right side of the line. During the period that the Halt was open the line at this point was single track. The second line was a feature related to the 'Gatewen Open Cast Disposal Point' . 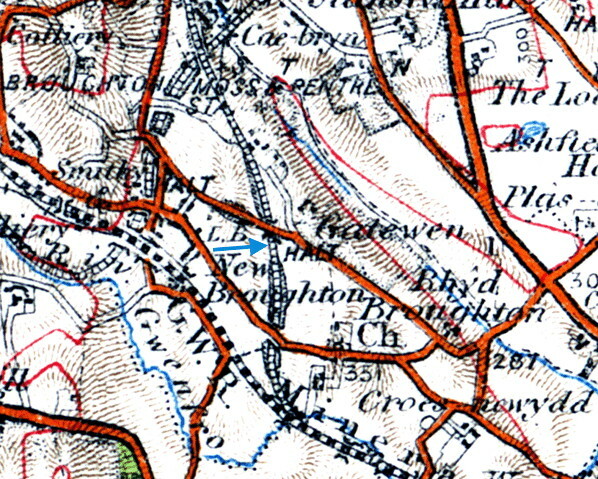 Gatewen Halt shown on a 1912 map. 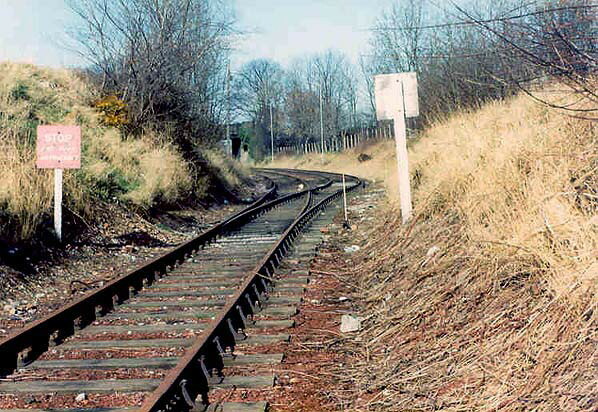 The site of Gatewen Halt looking south on the 4th of March 1983. At this time coal was being brought into Gatewen from Point of Ayr Colliery for storage. 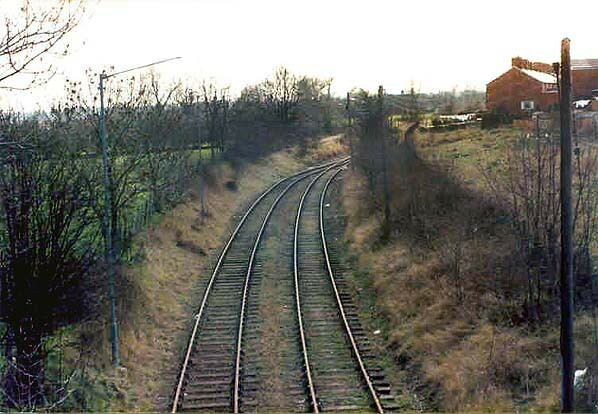 looking north from the site of Gatewen Halt on the 4th of March 1983. The platform had been to the left and a sloping path had led up to the road. Beyond the bridge can be seen the Gatewen Opencast Disposal Point which dated from 1957. It occupied the site of the Gatewen Colliery which had closed in 1932. Looking north at the site of Gatewen Halt on the 4th of March 1983. Looking north at the site of Gatewen Halt in April 2012. The site of Gatewen Halt looking south in April 2012.